The second half of the season has officially begun! It was another beautiful day in Ashkelon, overcast and cool for much of the morning. In Grid 51 they welcomed two new volunteers. Well, new to this year. Both Justin, a returning volunteer, and Nichole, the National Board Certified teacher heading up our educational outreach program, have been to Ashkelon before. They were able to join the crew in tracing floors, floors and more floors. In Grid 38 they continue to expose more of Phase 20B and the floors on which they can see monochrome pottery. Go ahead, ask someone in Grid 38 and you'll see why they are so excited. In Grid 44 we started dismantling the latest architecture and discovered a wonderful floor. It was a great way for our four new volunteers to start their season. One of the walls we removed was made of three column drums laid down horizontally over an earlier floor. 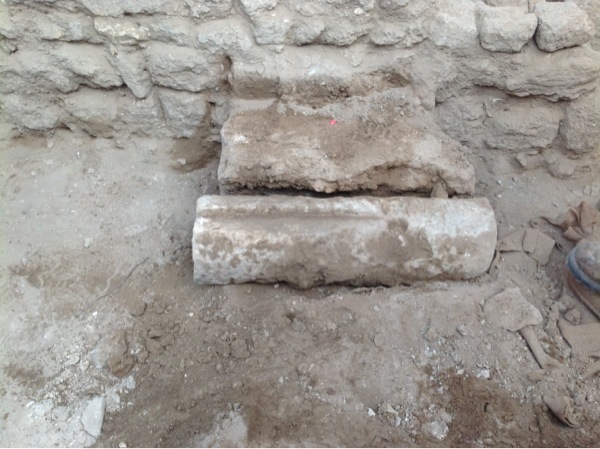 And one of those column drums was used as a doorstop before it was used in the wall.